In the excitement offered by social media, businesses often push out messages with little consideration to how consumers use these channels to talk back. Businesses see social media as 9-to-5 marketing whilst fans see 24/7 customer service and a new way to complain. When burned by unexpected negative comments and angry complaints, it’s tempting to delete and move on. But that only adds fuel to the fire. “Why are you deleting my posts?” becomes the new “Why are you ignoring my emails?” Only this time it’s public. Every good social response strategy has two key elements: (a) a set of house rules setting out what is acceptable on social channels, and (b) a well-thought-out social response plan. You need your house rules to establish unacceptable or abusive behavior, and, given cause, to ban repeat offenders. You need your social response plan so that you and your team are confident that, whatever the situation, you are prepared to respond to the consumer. A social response plan maps out all of the various scenarios that could arise on your social channels and allows you to rehearse responses to each situation. 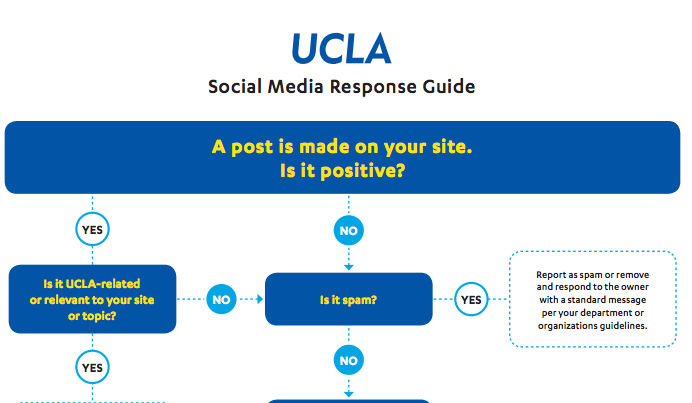 The University of California at Los Angeles, for example, has developed an internal “Social Media Response Guide.” To help implement it, UCLA has also produced a flowchart. UCLA social media response flowchart (click image to read entire PDF). To make your own plan, consider these questions. 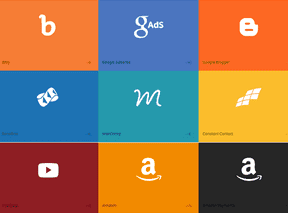 Which social platforms do you own and run? What are the most common communications from those communities? What would be the best feedback you could get from your community? What would be the worst? What are realistic timeframes for your business to respond? What kind of response times do your commenters expect? If a commenter is not happy with a response how can it be escalated? How do you respond to PR requests? Once you have established the possible scenarios, you are ready to contemplate your responses to each situation. 108|Idea Space, a marketing and design firm, offers these five tactics that will help shape your responses. Be transparent. Let the commenter know what your quality standards are. Take it direct. Move it out of the pubic domain and direct to the consumer. Be in the moment. Give clear timeframes and show you appreciate the urgency. Exceed expectations. Give the consumer options and show you are there to help. Not every situation will be easy to resolve. Here are a few occasions where you may need to tailor your standard responses. Trolling. “Trolls” lurk on the Internet to cause trouble. Approach trolls with caution. Trolls live to provoke a reaction; they are often abusive and repetitive. In most cases, your house rules will allow you to rid your community of these users quickly. Escalation. When a consumer is dissatisfied with a response, create a process for escalating. This reassures the consumer that the matter is receiving the due level of attention. Escalations should be a part of your normal customer care process. Critical mass. 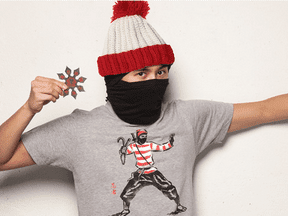 Occasionally businesses face a critical mass of complaints from a highly vocal group. These users often post in support of a specific issue-based campaign. Businesses in sensitive areas will need to have a system to monitor the level of similar issue-based comments and be ready to step in when required. An escalation could involve a post to address the issue publicly. Responding to events. Finally, consider how you would react to a disaster that is out of your control, such as terrorism or natural disasters. This differs from a business crisis, where a full response is required. Instead, the response is often simply to pause activity and respect the seriousness of the event, to avoid appearing insensitive and provoking a negative reaction.